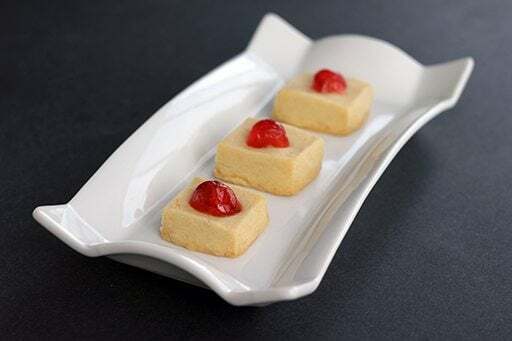 Shortbread bites are little individual bites of buttery goodness. 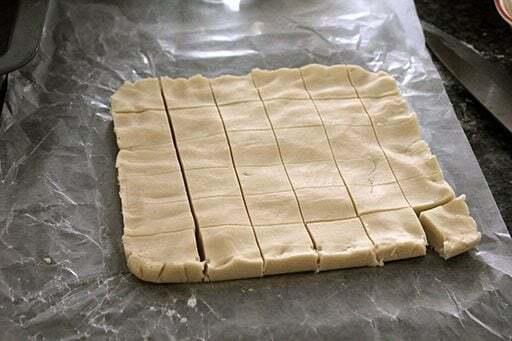 They are the same recipe I came up with for my Classic Scottish Shortbread but using a different method to make them into little thick squares that are individually decorated. They are a more classy and simple way of baking up shortbread, eschewing the need to fiddle around with cutting out trees and stars. Cream together your butter and brown sugar, making sure that there are no lumps in your brown sugar. Add in the icing sugar and combine. 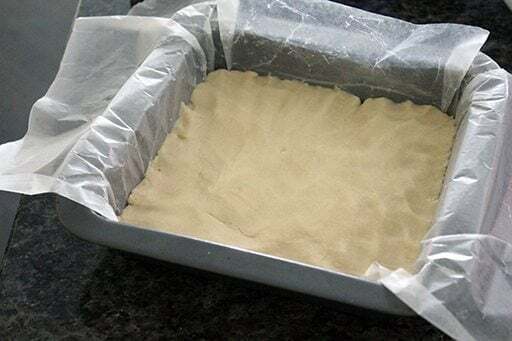 Add in the salt and flour slowly, with the mixer on low – this is not whipped shortbread after all- until the dough is completely mixed together. Pat the cookie dough into an 8×8 wax paper/parchment paper lined pan. Place in your freezer for 15-20 minutes. Remove from the freezer and cut into squares. Place on a parchment lined baking sheet and decorate as you wish. I love half a candied cherry on top, it’s the perfect size. Bake at 325 degrees for 20-25 minutes, until the cookies are lightly browned. Ta-da!! 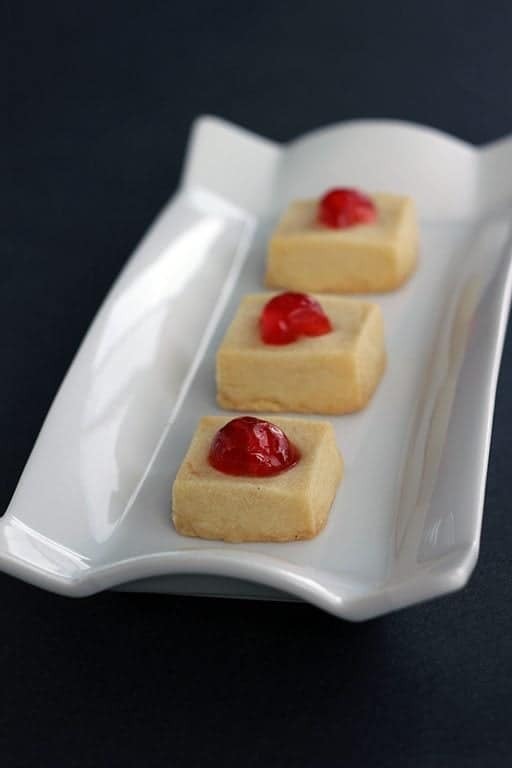 Gorgeous little shortbread bites! How easy is that!! I’ve sure discovered a new-found love for shortbread this Christmas. You have to love how easy yet decadent and tasty these are! Delicious buttery shortbread baked into squares instead of dropped onto a cookie sheet. Add in the salt and flour slowly, with the mixer on low - this is not whipped shortbread after all- until the dough is completely mixed together. Pat the cookie dough into an 8 x 8 wax paper/parchment paper lined pan. Remove from the freezer and cut into squares.Place on a parchment lined baking sheet and decorate as you wish. I love half a candied cherry on top, it's the perfect size. Quick and easy. I will be making these. How much salt do you use? Use salted butter! In need to edit that up. Salted butter is the best! I’m wondering if I could use half a merichino cherry on top? I don’t put salt in my shortbread, whipped or plain, but since I don’t specify unsalted butter, you can use salted to get that sweet/salt combination. Thanks for sharing. I love the idea of putting it in a pan and freezing it so you can cut it easily into squares.